Time for your behind-the-scenes look at Mission 004 page 01. 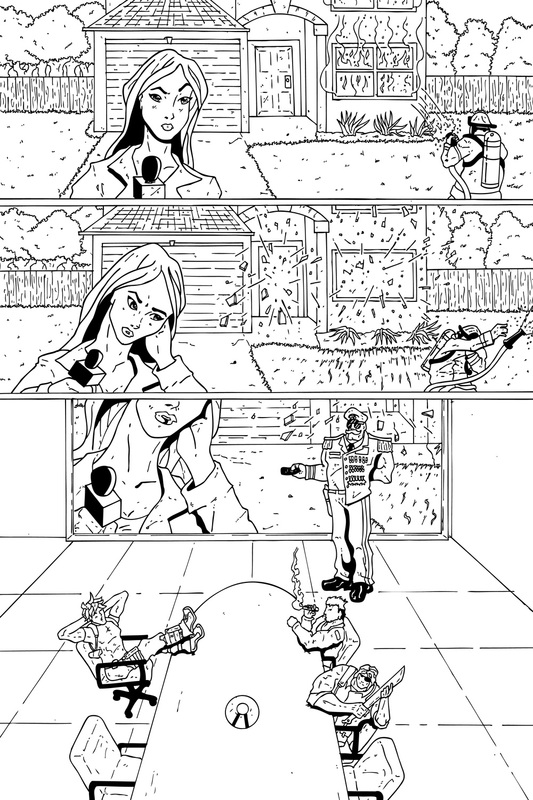 The hardest part of this page was deciding what should should be inked and what should be left for coloring. When you have fire and explosions it can be easy to get carried away while drawing and inking and then it can take away from the final result. When you have 2 panels that have identical backgrounds it can be hard to ink those as well since not only does it have to match up but you have to get the same line depth on each panel. It always takes me a few pages of each issue to determine just how much hard black shadows to add. I don’t want to have not enough so the page doesn’t have much contrast but I also don’t want to have too much so that I can’t play around with colors later on. This is something every artist/inker needs to decide for themselves as there is no right answer. Have a great new comics day and I’ll see you all back here on Friday for the release of the pencils to page 01!